Sen Kirsten Gillibrand has officially announced she is running for president, joining the long list of Democrats who hope to face off against Donald Trump in 2020. And the New York Democrat used her announcement video to hit out at Trump as she declared 'brave doesn't spread hate, cloud truth, build a wall'. The senator also revealed that she will give a speech in front of Trump International Hotel in Manhattan on Friday so that she can deliver her 'positive, brave vision of restoring America's moral integrity straight to President Trump's doorstep'. Gillibrand, 52, launched an exploratory campaign in January, but made it official with the two-minute video on Sunday, which she posted on her Twitter account. At the beginning of the video, Gillibrand mentions the Star-Spangled Banner, which has become a lightning rod for political debate in the last few years due to the NFL protests against police brutality. 'Brave doesn't pit people against each other,' she continues, as clips of Trump and the 2017 Charlottesville riots play on the screen. 'We need to remember what it feels like to be brave,' Gillibrand continues as she lays out key points of her platform. 'We launched ourselves into space and landed on the moon,' she continues. Gillibrand then reveals it was the 'brave choices of Americans' that inspired her to get into politics and, now, run for president. 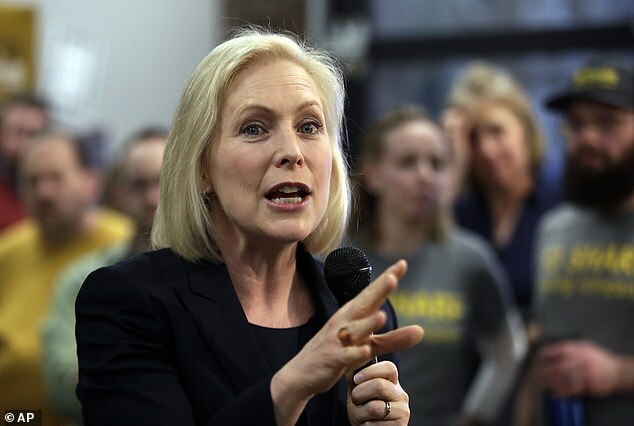 Gillibrand is the thirteenth person to enter the crowded race for the Democratic nomination, announcing her bid just days after former Texas congressman Beto O'Rourke. She is one of six woman campaigning for president, including fellow senators Kamala Harris, Amy Klobuchar, and Elizabeth Warren. And the list of Democrats running for president could still get longer, as former Vice President Joe Biden hinted on Saturday that he may still enter the race. In a keynote speech on Saturday at a dinner for the Delaware Democratic Party in Dover, Biden boasted that he has 'the most progressive record of anybody running'. He quickly corrected himself, clarifying that he meant to say 'anybody who would run,' then adding 'I didn't mean it' while a cheering crowd in his home state nearly drowned him out. Gillibrand will travel to Michigan, Iowa, and Nevada this week in the launch of her official campaign before her speech in front of Trump International Hotel on Friday. Much like her announcement video, Gillibrand makes her stance against Trump clear on her campaign website, noting that she has the 'strongest anti-Trump record in the entire US senate'. 'We need to do more than just defeat president Trump – we have to restore moral integrity to America's leadership,' she declares in her platform. Gillibrand's name has risen to prominence since she won her first House race in a heavily Republican district in New York in 2006. Three years later, Gillibrand was tapped to fill Hillary Clinton's Senate seat after Obama selected her as his Secretary of State, and she most recently won re-election with 67 percent of the vote in 2018. Gillibrand was also the first senator to call for former Sen Al Franken to resign following sexual misconduct allegations, which won her both praise and criticism within her own party. But just this week Gillibrand was forced to defend the handling of sexual harassment in her own office as a former female staffer revealed she had resigned after she was repeatedly harassed by a male aide. Gillibrand will have to make up a lot of ground as she begins her formal campaign. The New York senator has yet to reach 1 percent in the polls, which is a requirement by the Democratic National Committee to be included in the 2020 debates.